The years between 1946 and 1960 are fresh in most older Americans' memories. They were good times for many, as the agonies of the Great Depression and World War II had come to an end and it was time to catch up for all of the lost time. GI's and their brides settled into new suburban settings in unprecedented numbers, contributed to the emerging baby boom, and enjoyed the rewards of economic properity and a new consumer culture; modern America had indeed made its debut. It was also a time, however, with an ugly side that is less likely recalled so dearly. Jim Crow was alive and well, women were largely relegated to the responsibilities of a domestic life regardless of personal choice, conformity was the norm, and the Cold War stirred both witch hunts and fears of nuclear Armageddon. It was a complex time that is, paradoxically, remembered for its simplicity. What was life like in one small town during those days? Can we trace national macro-trends and developments in one locale? 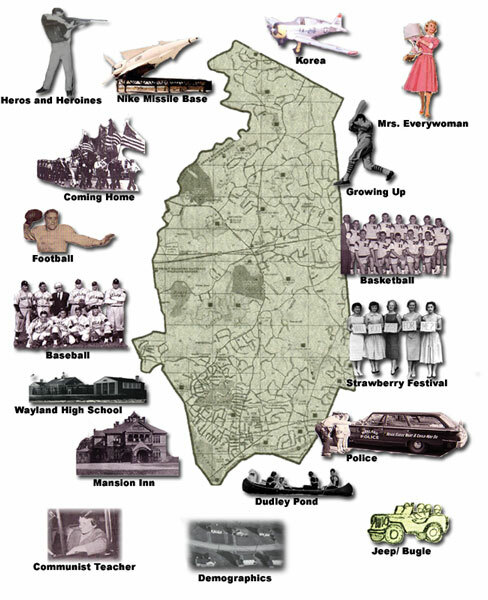 To find out, the Wayland High School History Project team embarked on this quest in the Spring of 2004. A second group continued the work in the Spring of 2005, completing the site. View our Flash Slideshow by clicking here. 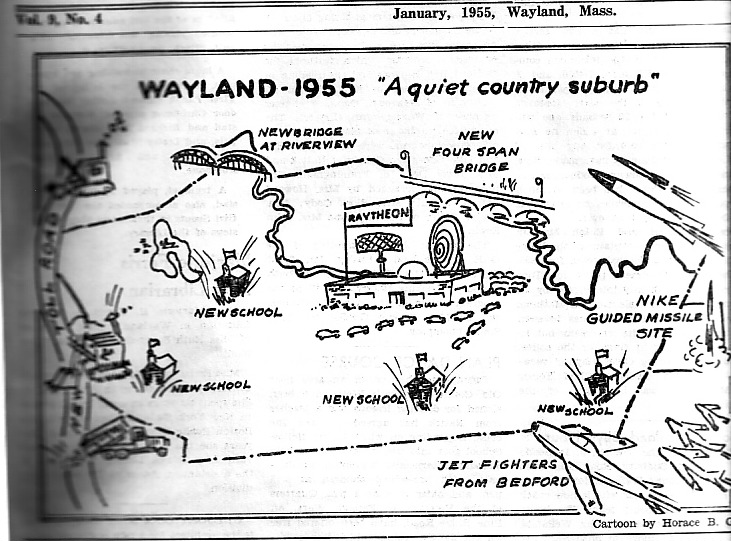 As you explore the pages on Post-War Life, you'll note that indeed in many ways life in Wayland Massachusetts serves as a microcosm of the national experience. The quaint, rural town more than doubled in size in ten years time, farms were replaced by residential developments, and new employment opportunities presented themselves in corporations like Raytheon. Men returned home from World War II and found the old and familiar blending with the new and different. Many vets settled down, married a high school sweetheart, and contributed to the baby boom. Families stocked their homes with a wide range of consumer goods advertised in the Town Crier and available in a number of area department stores or down at the new Shopper's World in Framingham. Children could enjoy the baseball, football, and basketball programs, which in the 50's were second-to-none. Come spring, hundreds gathered to celebrate at the annual Strawberry Festival gobbling down treats, square dancing, and eagerly awaiting the crowning of the Strawberry Queen. Summertime meant lazy afternoons of Lake Cochituate and Dudley Pond. It was a good time and a fine place to raise a family claim "Mrs. Everywomen." Everyday life resisted the intrusion of international issues relating to the Cold War, but citizens couldn't escape the realities of the Post-War world order. A handful of Wayland's finest were called to duty in Korea, and the trauma of McCarthyism hit us hard. Our victim was the well-respected second grade teacher Miss Ann Hale, ousted from her job due to connections with the Communist party. In the northern reaches of town the military constructed a Nike Missile base as part of the national defense system, and some 500 citizens were involved in the Civil Defense Program. Yes, Wayland was changing with the times and the growing pains could be severe. Few could object to the assignment of street numbers to all homes or the new dial phone system that replaced the old crank phones. Gone, however, were the familiar voices of the operators at the Wayland Center switchboard. While urban renewal efforts 15 miles east in Boston resulted in the razing of the old West End, the local Board of Health determined that some 80-90 old shacks around Dudley Pond should be similarly knocked down and the area modernized. Perhaps the devastating fire at the local Mansion Inn most succinctly represents the changes of the period: just as the smokey remains of the pond-side Inn dissipated in the wind and the site was readied for the latest of the residential developments, so went the ways of the pre-war rural town, the memories of which fade as the calendar pages turn. Special thanks to Mrs. Joanne Davis, Mr. Richard Hoyt, and the Wayland Historical Society and Mrs. Ann Knight and the Wayland Public Library. Generous funding comes from the Wayland Public Schools Foundation.